It is possible to have up to five public IPv4 and IPv6 addresses per your UpCloud server. You’ll need to shut down your cloud server before making changes to the network interfaces. 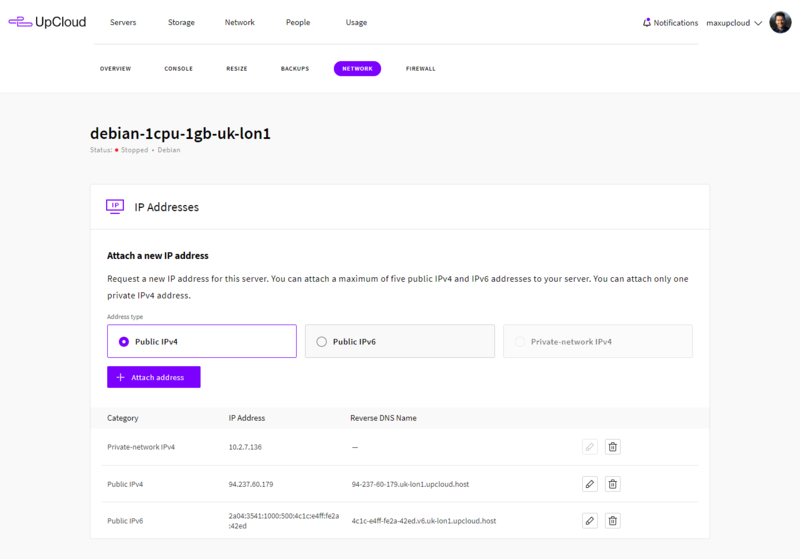 Afterwards, you can attach new IP addresses by logging into your UpCloud control panel and going to your server settings and Network tab. While the server is powered down, add a new IP address by selecting the type of an address you want, public IPv4 or IPv6, and clicking the Attach address button. You’ll get a confirmation notification and the new address will then appear on the list. That’s how easy it is to attach new IP addresses at your control panel. However, there are some operations that must be done at the OS-level in order for the system to become aware of the changes. Check below for the operating system specific instructions for your server. Log into your cloud server. Once in, you’ll need to add a new interface configuration to the /etc/network/interfaces file. Open it for edit with elevated privileges. Then enter one of the examples underneath to the end of the file. The number of the network interface needs to be unique, set it to one larger than the previous one. If you haven’t added addresses before it should be eth3 like in the example here. In the case of IPv6 the syntax is a little different, use the following instead. Afterwards, you’ll need to restart the network to have the changes take effect. Check that the new interface appears and shows the correct new IP address with the following command. On Ubuntu, you might also need to add the following to the specific new network interface, replace the number on the lines as appropriate. Once you’ve saved the sysctl.conf, update the system. Then restart the network or interface using the same command as above and check the IP addresses again. Once you see the new interface at the end of the list like in the example above you’ve successfully configured a new IP address to your cloud server. 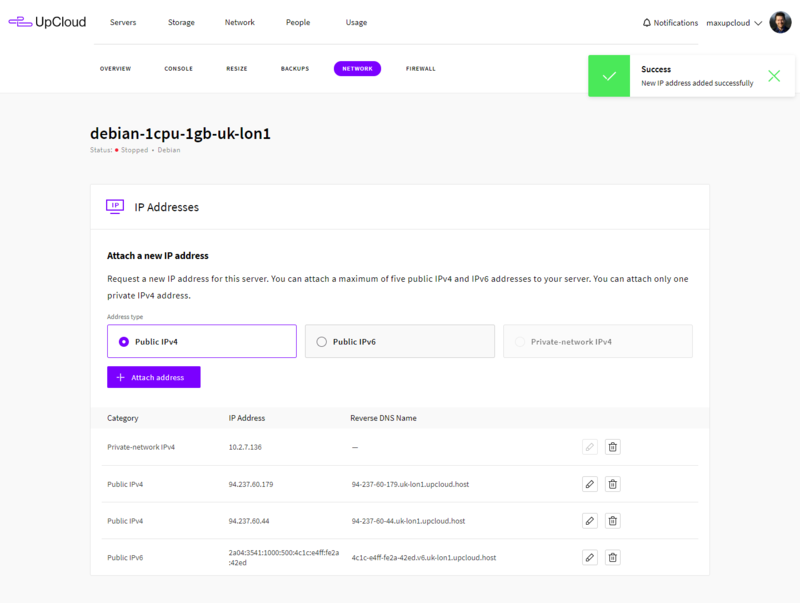 It can now be used to connect to the host just like the other addresses. If you have problems reaching one of the IP addresses with ping, for example, try rebooting the server and test the connection again. Also, make sure your firewall settings allow connecting to the new IP address as well. You’ll need to create a new network interface configuration file in the /etc/sysconfig/network-scripts folder. Copy one of the pre-existing files to have a starting point, for example, the ifcfg-eth0 to ifcfg-eth3 with the following command. Then open the new file and change it to suit the new interface. Replace the device number on the first line with a new higher number. Commonly it would be eth3 like in the example below if this is the first address you are adding after deploying the cloud server. If you are attaching an IPv6 address, you can copy the existing IPv6 configuration. Then change the device name, for example as below. Check your /etc/sysctl.conf, make sure the default rp_filter is set to 0. If not, open the file to edit and add the parameter to the end of the file. If you made changes to the sysctl.conf, update the system. Use the following command after you have done these operations to restart the network. Then check the IP configuration. When you see the new IP address in the command output it’s connected and ready to use. New network interfaces for IPv4 addresses should show up automatically without manual configuration. In the case of IPv6, you should run a couple of commands via Command Prompt with Administrator privilege. Open the program by typing cmd in the run window and press enter, then copy in the commands below. Afterwards, you should restart the new network interface by disabling and re-enabling it at the Network Connections window. Note that Windows Server firewall blocks ICMP requests by default. If you want to test the new interface with ping, open the firewall settings with wf.msc in the run window. Find the ICMPv4 and ICMPv6 protocols in the Inbound Rules and enable the ones you need. It’s also possible to manually set additional public IPv4 addresses to the primary interface, for example creating aliases like eth0:1, eth0:2 on Linux, by using static configuration. Currently, this is not supported with IPv6 addresses. You can find instructions for setting up alias addresses at our articles for configuring floating IPs on CentOS, Debian, Ubuntu or Windows.